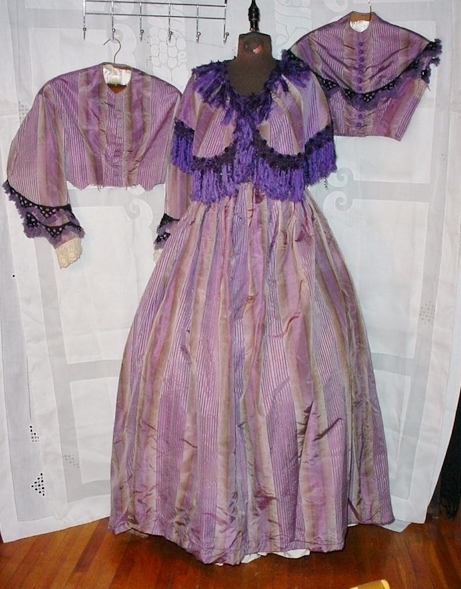 This is an amazing four piece silk outfit, c.1860-65. 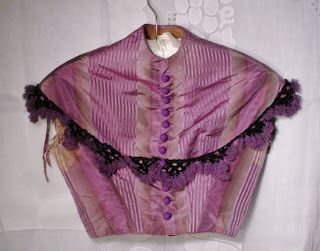 The hombre stripe silk is in shades ranging from beige to a light purple lavender. The bodices and cape are trimmed in a black and purple silk chenille, the fringe also features tiny black satin bows on strings. The long sleeved bodice is boned, lined with cotton, closes with hooks and eyes. The wrists have a cotton eyelet cuff. The sleeveless bodice is boned and also lined with cotton, bottom edge is piped, it closes with purple thread buttons. 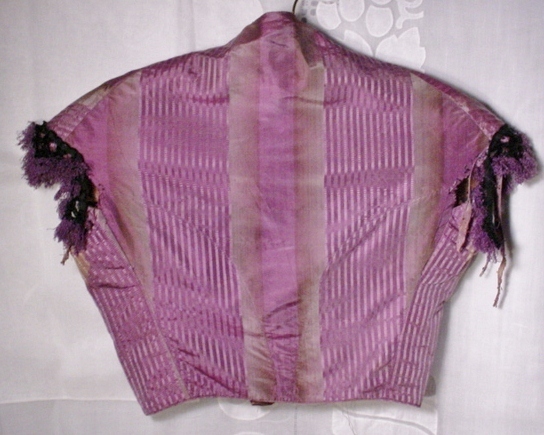 This bodice might've had small cap or narrow puffed sleeves, the armsceye is irregular, there is also some fading in the underarm area. The fringe around the armsceye and bodice looks to be all there, but needs to be reattached. 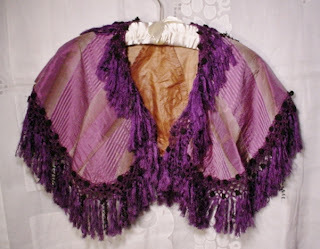 The capelet is lined with cotton, trimmed with the same purple and black chenille and silk fringe seen on the bodices, and measures 5" along the bottom edge, about 4" at the neck. It has no closures, and is in very good to excellent condition. The skirt has a cotton waistband, is pleated all the way around, with somewhat tighter pleats towards the back. It's lined with cotton, has a wool tape at the bottom edge. 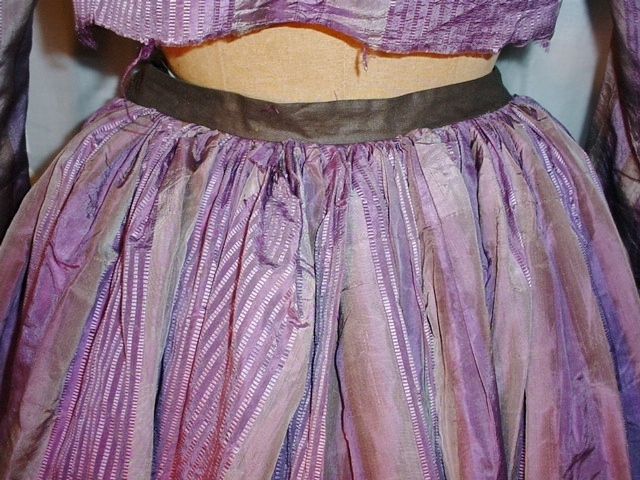 The skirt has a 35" waist, is 43" long in front, 46" long in back. The front has a 2" hem, where it has been taken up from the original. The waistband has also been replaced, the original would've had cartridge pleating. There is a handprint sized area with some black streaks near the hem, another area about 4" x 1" with similar spots, perhaps a few other minor spots, the fabric is in very good shape otherwise. Though the waistband has been altered, the skirt still has a very large sweep, and I have shown it over several crinolines. 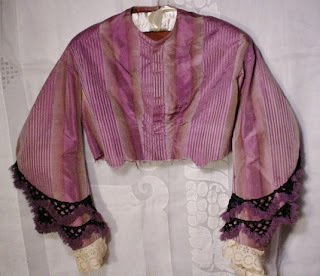 The long sleeved bodice has some underarm fading, and has been cut along the bottom. It's about 12" long in front, at the closures, about 14" long in back from the collar seam to the bottom edge. 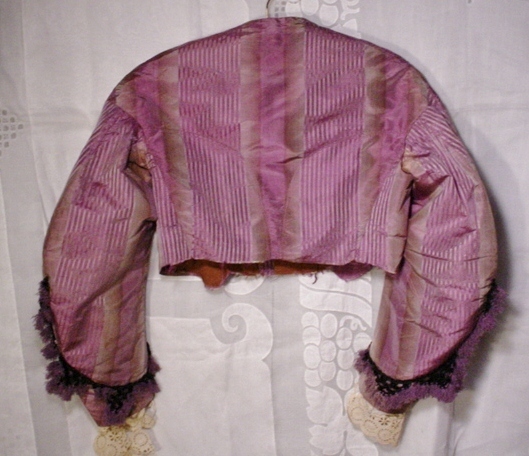 The sleeveless bodice has some jagged edges along the armsceye, as noted, some fading also in this area, a small a small hole near the bottom front edge. 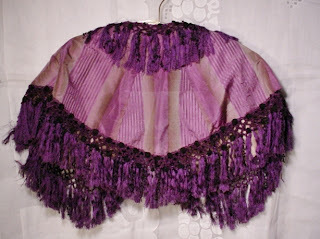 Please note that the fabric is a maroon purple, not the royal purple that it might appear to be in the pics. None of the fabric is splitting or shattering, some of the satin bows on strings are missing from the fringe. The waistlines indicate this is from after the American Civil War - more along the 1866 lines.